Today I was delighted to be at Pleckgate to provide a series of sessions for students as part of National Poetry Day. The welcome was lovely and I have to say that each time I’ve visited I’ve found both students and staff to be attentive and supportive. More importantly perhaps they’ve been open to learn about poetry, hear examples, to get involved in active discussion and even a little acting. With four groups of students including years 7, 8 and 10 I was kept busy, and happy, helping to inspire and being inspired myself. 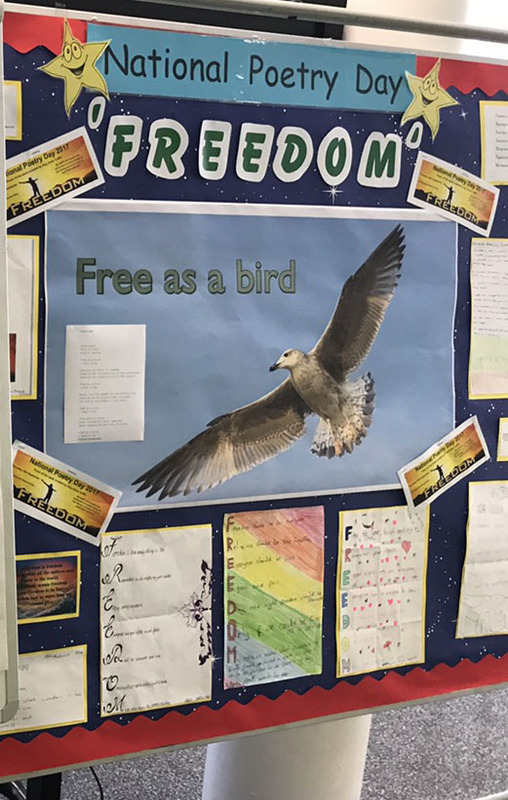 Each group had a discussion of concepts of freedom and each student wrote a sentence or just their thoughts some of which are shown in the images below. 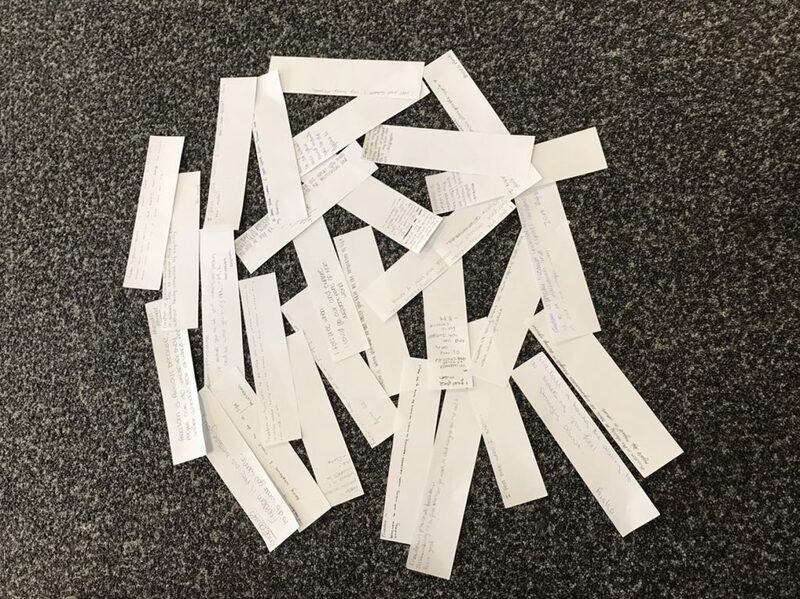 All of those thoughts, 180 or so, of them will be read and collated to create a poetic interpretation to be shared back in school. My early reading is proving to be really enlightening and I’m looking forward to reading the remainder. Once we’d done the “hard” work around freedom it was time to have some fun with poems; and we certainly did. At lunchtime students and staff came together to share some of their own new work and some favourite poems. The variety and the quality of the writing by the young people was astounding and bodes well for the future. Links to the school’s own report and photos from the day will be added here as soon as they are available. Why do I read poets from other cultures? As a poet one might be expected to read quite a lot of poetry. That isn’t a universal truth, but then nothing is; or if there is we haven’t really discovered and understood it yet. Some poets do not read any other poet’s work for a wide range of reasons, examples I’ve come across include; not wishing to be influenced too much, concern that they might accidentally copy or plagiarise someone else’s words and quite commonly that “these are my thoughts, my words, they come from inside of me and they have no relationship to anything else that has been written, they can’t be changed” (or words to that effect). These are sometimes similar reasons why some poets chose not to edit. Maybe that will be the topic for a future post. I am not one of those poets. I do read other poets’ work. Apart from British and Irish poetry my current bookshelf includes poetry from Venezuela, Brazil, Chile, Russia, Poland, Spain and of course the USA (yes, that counts as overseas too). Firstly reading poetry is fun, sometimes thought provoking, annoying or sad but always enlightening. Poets from all cultures tend to write about pretty much universal themes; family, love, loss, death, society and nature; but different cultures tend to view some of these things differently and that in itself makes their work interesting to read. Added to that the actual structures of language are fundamental to how poetry works and in different languages poets will by definition express themselves differently. Sadly I can only read fluently in English so I am relying on the translators to have kept as much of the original cultural, rhythmic and feel of the poets’ native language versions. Ideally for European languages I prefer to read the English translation with the native language version alongside because although I can’t really read the originals properly I can get a feel for the rhythm and flow and see how the language was structured. 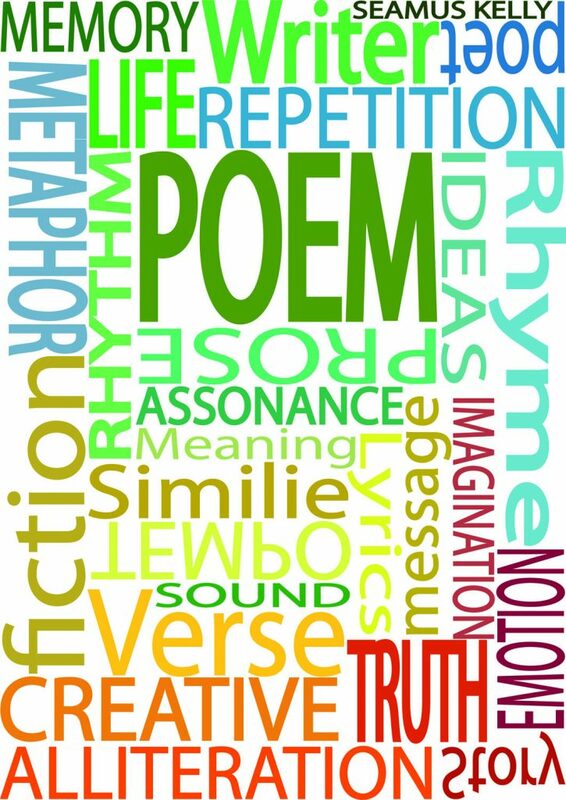 This is where things get interesting; word sequences vary from one language to another and in poetry those word sequences are carefully chosen by the poet rather than always using the most obvious or common turns of phrase. Additionally the subject matter varies between cultures. Almost all poets talk about a mixture of autobiography, life, death, hardship, love, society, politics and frequently nature. Views of such things are very different between cultures. 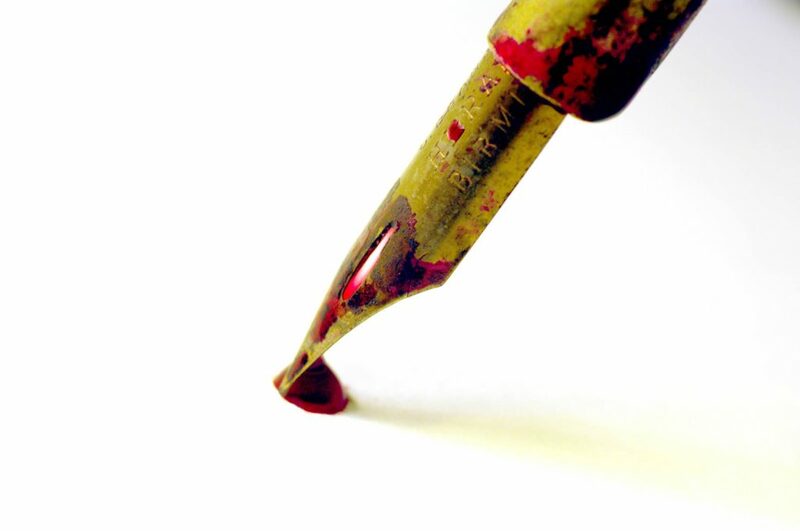 For example in countries where freedoms are very limited the poets will often write about freedom as much as they will about the lack of those freedoms whereas in countries that have much greater freedoms those freedoms can be somewhat taken for granted and the poets tend not to place so much emphasis on them. Another example is the poetic treatment of death. 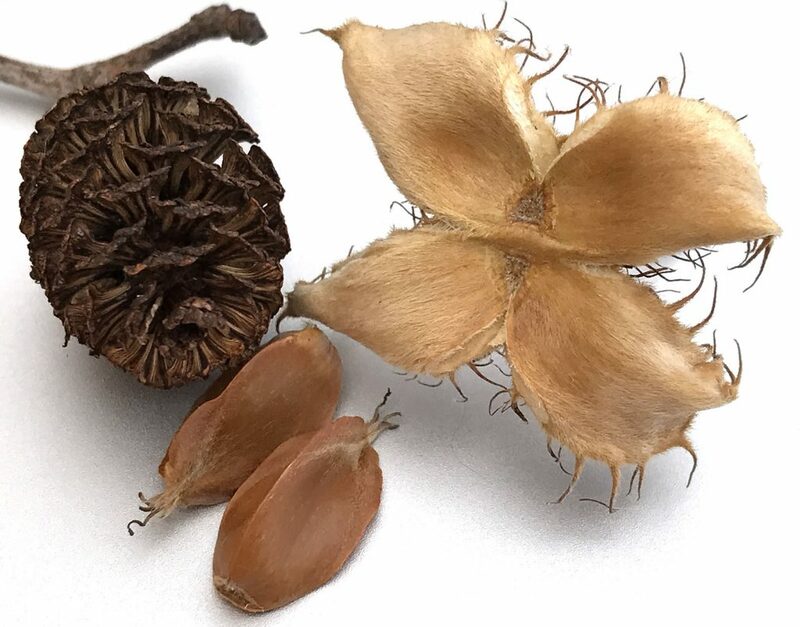 In the UK death is something people don’t talk about if they can help it, something that although inevitable can be ignored and something that people and society find hard to address. Contrast the UK attitude to death with that in Ireland or Latin America where, although life is valued and celebrated, society doesn’t hide death and makes a much bigger fuss of it. A quick read of Seamus Heaney or perhaps Pablo Neruda will show the different attitudes. As a poet I hope that I bring new perspectives to issues, that I talk about them in new and different ways and I know that by reading overseas poets I can broaden my own experience and further develop my own abilities as a writer. In a series of future blogs I intend to focus each piece on a poet (or poets) from a different culture and show why I find that work interesting, broadening and worth reading. Perhaps that would be useful for any poet. As Autumn begins National Poetry Day also arrives, on 28th September 2017, with its annual celebration inspiring people throughout the UK to enjoy, discover and share poems. Could there possibly be a bigger or more pertinent theme for National Poetry Day than this year’s choice “Freedom”? There will be events around the UK with schools, libraries and writing groups and I’m delighted to be heading over to Pleckgate High School in Blackburn where I will work on some classic poems with young people and share the work of pupils and staff. The day is intended to inspire and there is no doubt that working with young people is always inspirational. You can read about last year’s event by clicking here and I will of course report on the event afterwards. Is a poem ever really finished? As a poet who also runs writing workshops one of the most frequent debates I come across is about when or whether a poem is finished. On the face of it it might seem a fairly straight forward issue, especially to anyone who isn’t a writer and more specifically a poet. 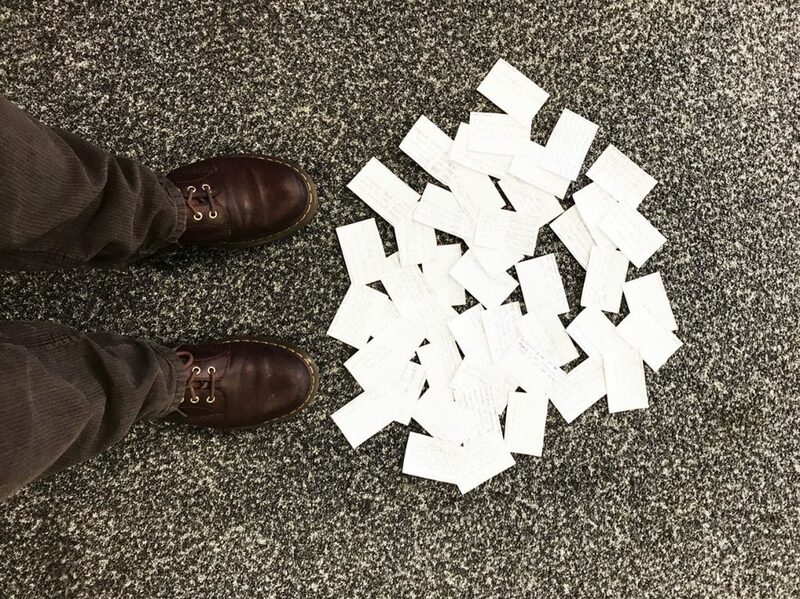 Say I’ve written a poem, I’ve read it through a number of times, made some changes, taken it out to live events and considered the audience reaction and the way the words flowed (or didn’t) and maybe made some more changes. Eventually I might well have submitted that poem for publication or included it in a book. Is that poem now finished? In the past I might well have thought so but recently I’ve realised that such a view might have been a little short-sighted. Take a band who become famous and tour around the world for 20 years. Everywhere they go their audience expect to hear that old favourite song, the one that everyone knows. But the band have played it so many times that they’ve started to make little tweaks, the odd word here or there or maybe a change in the instrumentation. They still perform the same song but not exactly as it was 20 years ago. They’ve become more accomplished as singers, songwriters and musicians and it is really no surprise that they now see better ways with that old song. What about Bob Dylan’s “Knocking’ on Heaven’s Door” which Dylan himself has recorded in various versions, mostly longer that the original and which has been covered and changed by many others including some cases where whole new verses have been added and some cases where a band has recorded more than on different version of Dylan’s song. Will “Knocking’ on Heaven’s Door” ever really be finished? Poems are a bit like that, they can evolve. If they were a B-side that never got played or did little more than balance out the numbers on an album, the track everyone skipped over, then maybe they are finished. They’ll lie there unlisted, unread and certainly no longer performed. 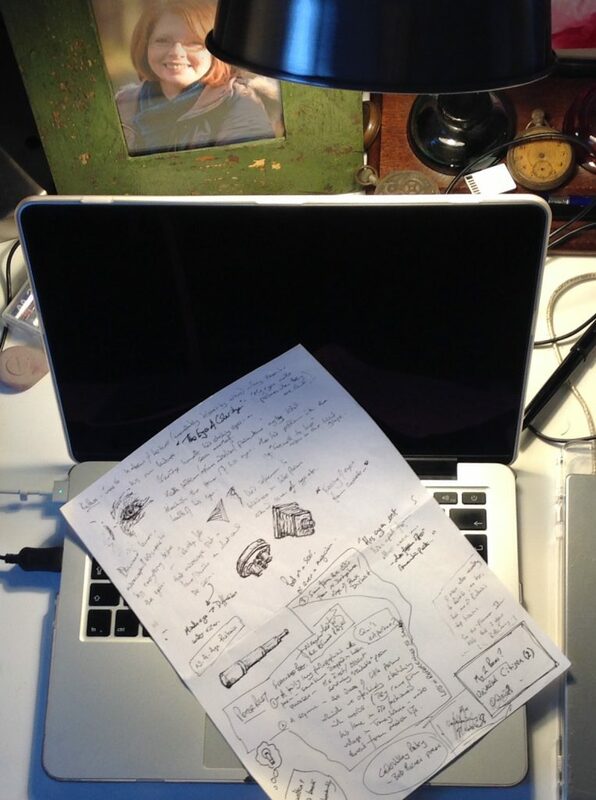 Those poems and those songs might well be finished; maybe. I doubt that I could ever say definitively that any of my poems are finished. And what if someone changes it after I’m gone? A whole new world of finished/unfinished would open up. Maybe all of Beethoven’s Symphonies were unfinished and all of them change each time a new conductor and a new orchestra, or even just a new audience, get their hands and ears around them. This afternoon members of the Touchstones Creative Writing Group had invited me along to facilitate their session and I delivered my brand new workshop. The importance of writing groups for very many writers, whether novices or very experienced, should not be underestimated. A group like this creates both the space and motivation to write and of course the support of fellow writers and on occasion the support and encouragement of professionals. All of this helps development and also helps writers to extend their range and experience styles and subjects they might nor otherwise have tried. Today in Touchstones those were exactly the aims of the session and it can be quite challenging to get writers to stretch beyond their confidence zones. It is also highly rewarding for those writers when they find a new approach and create something that even an hour earlier they would not have envisaged. The smiles, thanks and acknowledgments from all of the participants are ample reword for the facilitator (although of course the fee is most welcome). Using a set of scenarios randomly selected by participants we watched and listened as new work took shape from a completed, well structured, poem to short stories encompassing Yorkshire’s tribal elders, a dodgy regime exiling people to space, being unwittingly stuck in a cupboard in an academic establishment, representing a Neighbourhood Watch and spiritual experiences on a mountaintop. None of these things were included in the original prompts and none were written from the direct experience of the writers. The writers were unanimously surprised by what they had written and very happy to have stepped beyond the realms of personal experience. It is a measure of the success of a workshop when a participant books the same workshop for their own group so I was particularly pleased to be invited to deliver the “I’m not supposed to be here” workshop in two weeks time for the Langley Writers group. The group meet monthly at Demesne Community Centre, Langley, Middleton and the session on 23rd September will run from 2.00pm to 4.00pm and all are welcome regardless of experience. On 20th September I’ll be both performing my poetry and compering an evening including open-mic slots for this relatively young arts festival in Altrincham. The venue is Riddles Emporium, a new specialist shop specialising in spirits and based in a beautiful, traditional building at 35 Regent Road, WA14 1RX. Expect a varied poetry set with things to make you think, smile or cry and for this specific occasion there will be something brand new in keeping with the nature of the venue. This is a free drop in event for all ages although you can also book online with a £5.00 deposit to pay for snacks and drinks. 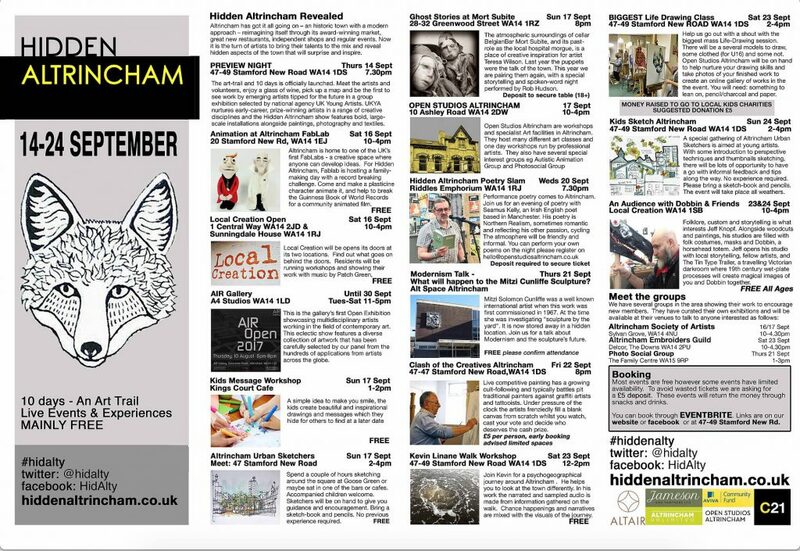 Apart from the poetry evening the Hidden Altrincham Arts Festival runs over 10 days in September featuring artwork in 30 locations; an art trail around this historic town and daily events and live experiences.